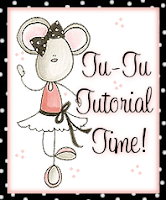 Welcome back for another Tu-Tu Tutorial Thursday! 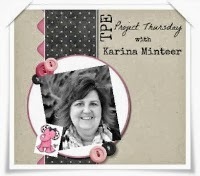 This week, Ann is making a really cool card that looks like a gift bag. I am so in love with this card and I know all of you will be too! It’s my turn to do a tutorial again and this week I thought I would play around with the idea of adding shredded paper to a card design to make it look like a gift bag. 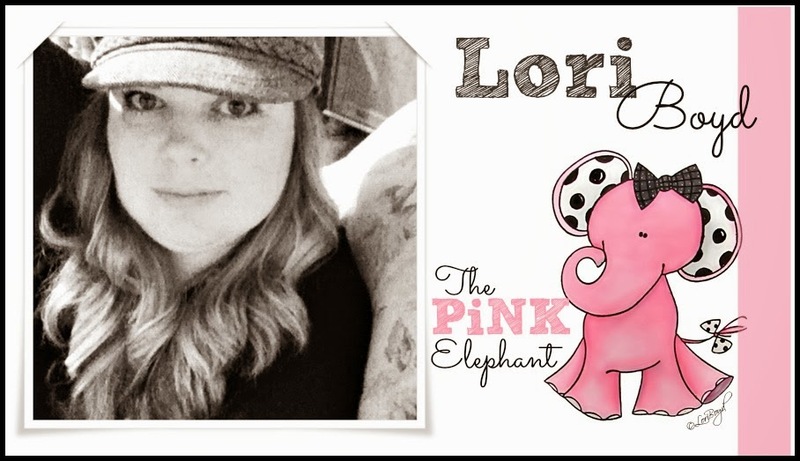 Before I start this tutorial though I would just like to wish Carol, one of our Design Team Members, a very Happy Birthday from all of us here at the Pink Elephant. It’s a special birthday for her this year so she needs an extra special card. I do hope you like it Carol! 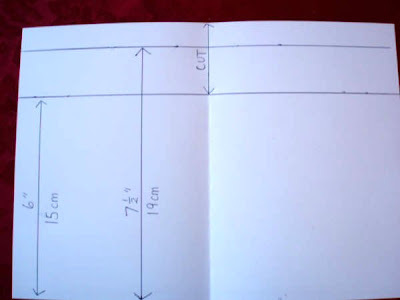 Please note I have given measurements in my tutorial, but the basic idea for the card could be made in many different sizes. I would love to see what you can come up. 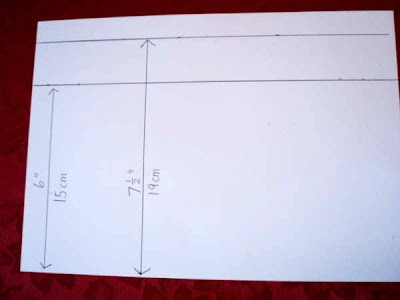 Begin by scoring the A4 piece of card along it’s length at 6” (15cm) and 7.5” (19cm) as shown in the photo. Fold the card in half lengthways and then cut down the fold line to the second score line as shown below. 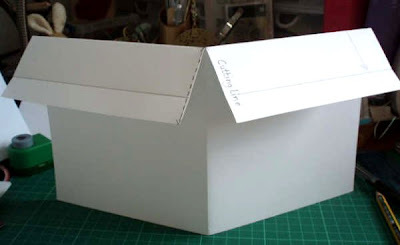 Now fold the card along the score lines so that the front and back of the card have a flap hanging down. 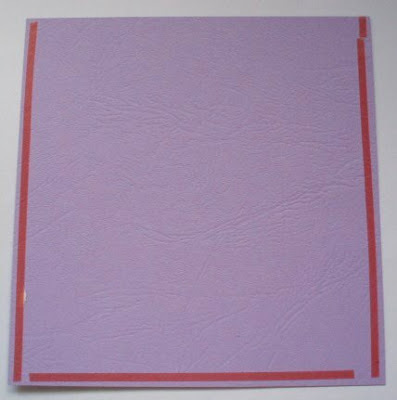 On the back of the card fold up the second score line and stick the whole flap securely onto the back of the card. This will help to keep this piece out of the way while you are constructing the rest of the card. In the middle of the front flap make eyelet holes about 1.5” from each side. Attach eyelets of your choice. Make a tag to be attached to your ribbon. This could made using the circle nestability die or any tag die or punch you have available. Starting from the rear of the flap thread the ribbon though one eyelet and then thread the tag onto the ribbon. The other end of the ribbon needs to be threaded through the other eyelet to the back of the flap. 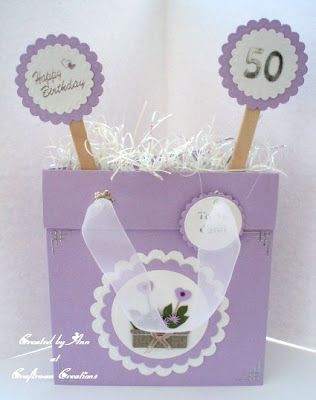 Leave a large loop of ribbon at the front of the card to represent a handle. 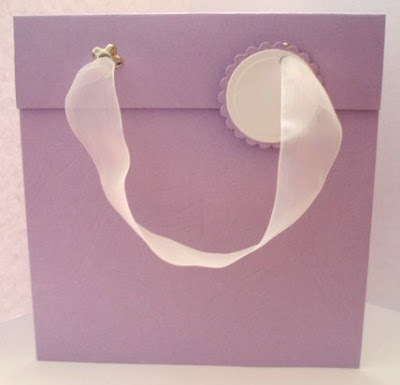 Fasten the ribbon at the back and then stick down your flap in the same way as you did on the back of the card. 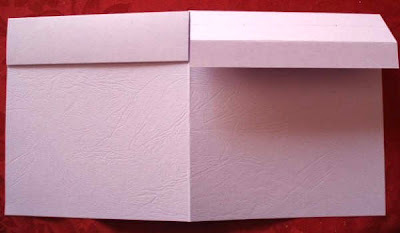 Now cut a piece of card slightly smaller than the front of your card and attach the extra strong DST to the two side edges and bottom of the piece of card. The top needs to be left free of tape as this will not be stuck down as it is where the shredded paper is added. Stick this piece of card to the other side of the card front. And of course adding the shredded paper to the top. I found that the best way to add this was to pull a small amount from the bag its sold in and roll this into a ball between my hands. You can then push the ball into the opening at the top of the card fluffing it out a little as you do so. Once you have got the shredded paper in place you can add your lollipop stick signs. These are not essential, but I think they add a bit more fun to the card. I used circle nestability die cuts to top my lollipop sticks. I stuck one circle on the front of the lollipop stick and one on the back so that both sides have a neat finish. 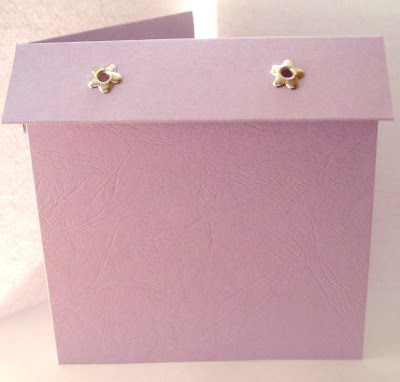 Add another inner circle with a sentiment and your card will be completed. I really hope you have enjoyed this tutorial and it’s given you ideas to use in your own card making. 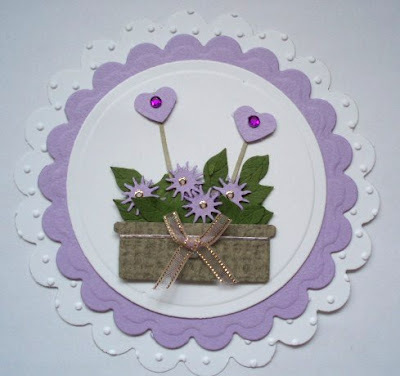 Fabulous tutorial Ann and a really fun card which will be perfect for so many occasions. I'm aleady imagining a Christmas version with sparkly shredded glitter paper and scrummy velvet ribbons. I love this tutorial Ann! I think this is so unique. I am so sorry I didn't comment before but Easter had me crazy and I had so little time to do much of anything.